December 27th 1777 is the burial date of the last Cornish speaker, Dolly Pentreath of Mousehole. Pentreath died on 26th December 1777. Although she never married, she had a son - although he, too, only had months to live on the day of her burial. It is hard to conjure the event, in that exposed and chilly churchyard, its very date only presumed. There appear to be no contemporary records – no reports, reminiscences, letters, and why should there be? 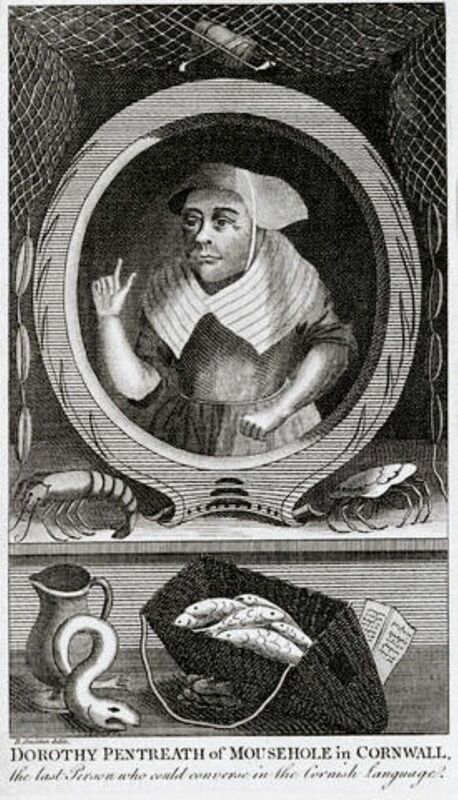 It is alleged that she ended her life supported by the parish, supplementing what relief she was granted by “fortune telling and gabbling Cornish”. So where was her son? Why was he not forced to provide for her? Was he untraceable, or in such poor health that he was unable to help his aged mother in her final years? And are we – or are we not – to imagine him mourning at the graveside? And the mysteries do not end at the churchyard gate. In what exact sense do we describe Pentreath as the last user of the living Cornish language? The inscription on the later memorial stone – “said to have been the last person who conversed in the ancient Cornish” – does not take us very far. Some say that the Cornish tongue lost its last native speaker – a person brought up with Cornish as their first language - not with Pentreath’s burial in 1777, but as late as 1891, with the death of John Davey of Zennor. Or even later – a John Mann, also of Zennor, was still alive and speaking the language in 1914. But both had mastered English, and were able to take their place as Britishers; stakeholders, as we would now say, in the Empire, in the modern world which was bringing electricity and the telephone into the West – and shortly into Cornwall. So perhaps Pentreath should be remembered as the last “native” speaker, the last brought up to speak Cornish, and with no significant English at all: “Diwettha kowser an yeth herwydh derivasow”. She certainly claimed that she knew not a word of English until the age of 20. Claimed, when gentlemen came asking, that she had no other tongue. Saw no need, perhaps. Or couldn’t master the grammar, or disliked the strange flat sound of the placenames. There is a tradition that her last words were a refusal to speak English: "My ny vynnav kewsel Sowsnek!" But is that just a little too good to be true? We are not even entirely sure how much Cornish she spoke, once she’d exhausted the vocabulary required for selling fish and, apparently for abuse – notably directed at Daines Barrington, the researcher who would make her famous, and also (although this story was not published until 1870) at the local squire when he upset her fish. There is, in fact, a great deal that we don’t know about Dolly. Her baptism was registered in 1692, which would make her age at death 85 – but it is often claimed that she lived to be 102. In 1768 she convinced researcher Daines Barrington that she was already 82, in which case she would have died at 91. Her death is not recorded in the parish register – unless she was going under another name – perhaps to lend legitimacy to her son. Even her appearance is uncertain. In Trerice is a watercoloured engraving, said to be a copy of Opie’s portrait. It shows a young woman with a large book. Also credited as Opie’s portrait – for example on the BBC website - is a similar picture but of an older woman, in a slightly different pose. But this is identified elsewhere as a representation of Opie’s mother. Other representations tend more to “generic fishwife” than to careful portraiture painstakingly observed from life. Over a century after Pentreath’s 1777 burial, it was stated – by a correspondent who claimed to be the grandson of the undertaker - that “eight chosen fishermen” acted as bearers to take her to her last resting place. “There was not anything erected on the old lady's grave as a tablet to her memory”. The writer continued, “I know quite well the grave where her remains are deposited," and later added – rather cryptically - "Dolly's actual resting place is 47 feet south-east, a point easterly from Prince L. L. Bonaparte's monument to her”. So is the memorial – moved at the end of the 19th century - now in the correct place? Or is Pentreath still watching us, amused at our efforts over nearly 250 years, from another spot entirely? “Dyw genes”, Dolly, wherever you are; whoever you were. Fancy learning a bit of Cornish? You could try Cornwall Calling or Cornish-Language.org (both accessed 1 12 2017) . Chons da!